Welcome aboard our England and India tour. 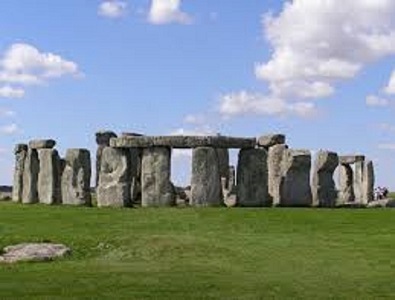 Starting with London explore the UK capital and travel freely around the city with a hop-on hop-off tour, and guided coach tour of Salisbury, Windsor, Stonehenge & City of Bath. 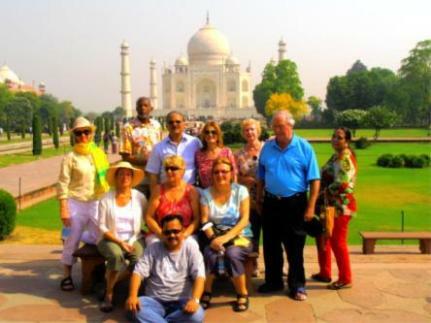 Then over to India, experience cultural and historically must visit places of New Delhi, the majestic capital of India built during British raj, pink city of Jaipur, home of jewel encrusted Taj Mahal Agra. Welcome aboard your flight to London, enjoy onboard hospitality. Get a closer view of the capital with a tour by foot. A London walking tour is one of the best ways to get to know the real heart of the city through the historical streets is both convenient and comfortable. Whether you are interested in the charming tales of the Royal family or the gruesome stories behind Jack the Ripper. These fabulous London walks are great to visit at your own pace. Wonderful London is waiting for you! Explore the UK capital and travel freely around the city with a hop-on hop-off tour. Take a seat on the top deck of the bus and get ready to surround yourself with the intoxicating sights and sounds of London. This is a great introduction to all the best landmarks and attractions and if you choose a flexible hop-on hop-off bus tour, visitors are free to ride the buses at their own pace. Touring London independently has never been so easy! Windsor Castle is the largest and oldest occupied castle in the world, dating back almost 1000 years it is the official residence of the queen. On your visit you can wonder round the State Apartments, steeped in history and abundant with antique furnishings. Lining the walls are priceless works of arts for you to admire by artists such as Rembrandt and Rubens. Be sure to visit The Queen Mary’s Dolls House which is truly a spectacular model. It’s one of the largest, most famous and beautiful dolls houses in the world. Built for Queen Mary in the early 1920s, admire the fabulous details of this model royal home; complete with electricity and working lifts this is a real treat to see. During your visit you will also see St Georges Chapel, the final resting place of 10 monarchs. 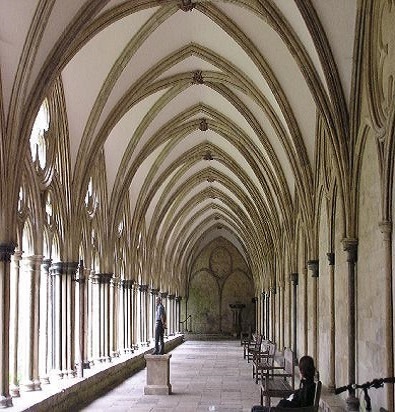 The gothic architecture of the stunning chapel is some of the finest in England. Breakfast at the hotel. Checkout by 12.00PM. Free day to visit t London’s famous museums and walk-about river themes. One of London’s main attractions is its fantastic selection of museums and galleries. The Victoria and Albert Museum is the world's greatest museum of art and design, representing more than 3,000 years of human creativity, with collections unrivalled in their scope and diversity. Highlights include the Medieval Renaissance galleries containing some of the greatest surviving treasures from the period, the breathtaking jewelry gallery and the stunning British galleries, illustrating the history of Britain through the nation’s art and design. Imperial War Museum IWM London’s world-class collections tell the everyday and exceptional stories of people whose lives have been forever impacted by war, with unique documents and objects, art, sound and film. This evening transfer to airport for your India bound flight to New Delhi. Enjoy onboard hospitality. Afternoon sightseeing in Delhi, drive past Rashtrapati Bhavan (the Presidential Palace) and the Secretariat buildings - the center of Government activity, down the impressive Rajpath (the main avenue), to the World War I memorial arch, India Gate, the High Court Building and the Old Fort. Visit Humayun’s Tomb built in 1565 AD by his grieving widow Haji Begum, the Qutub Minar, a 72 meters high minaret and the ruins of Quwat-ul-Eslam (Light of Islam) Mosque. Here, see Delhi’s most curious antique, the uncorroded Iron Pillar, which dates back to the 4th century AD. After breakfast depart for half old city tour of Delhi. Begin with a visit to Raj Ghat, where Mahatma Gandhi, the Father of the nation was cremated in 1948. Thereafter proceed to the magnificent Red Fort built of red sandstone, dating from the very peak of the Mughal power. Then, Rickshaw Ride through Chandni- Chowk. After that, visit to black and white onion domes and minarets of the Jama Masjid, the most elegant mosque in India. Afternoon drive to Jaipur Hotel Jai Singh Palace. Evening at leisure. Enjoy a sumptuous breakfast before boarding elegantly decorated elephants to visit former capital of Jaipur. The Amber Fort, just 11 Kilo meters north of the city, with its honey-colored fortress-palace in the Aravalli Hills. 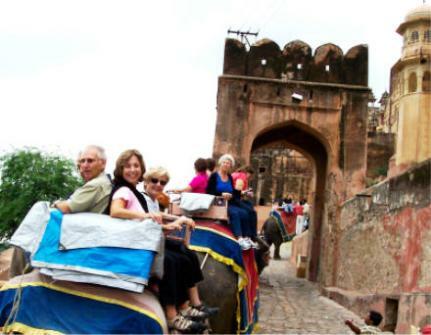 Enjoy an elephant ride along the fortress ramparts. Walk into the Sheesh Mahal and admire the amazing interior décor thought of over 200 years ago. Inside, The Hall of Victory presents a galaxy of decorative art panels of alabaster with fine inlay work. After lunch explore Hawa Mahal (Palace of Winds), Jantar Mantar (Jai Singh’s Observatory) built in the 17th century by the founder of Jaipur who was a prince, soldier, astronomer and builder, City Palace now a museum exhibiting fine Rajput and Moghul paintings, rare manuscripts and an armory. After breakfast drive to Agra. Enroute to Agra you'll stop at Fatehpur-Sikri, the deserted sandstone city built by Akbar principally as a military establishment in 1565, was partially converted into a palace during Shah Jahan's time. This imperial complex of forts, palaces, mosques and temples was short lived and remains a haunting testament to that era. Fatehpur Sikri is the best example of the culmination of Hindu and Muslim architecture. Drive continued to Agra on arrival transfer to hotel. Hotel Radisson/Shiraz. Early morning visit to Taj Mahal at sunrise the most extravagant monument ever built for love. On the death of his beloved wife Mumtaz Mahal, Moghul Emperor Shah Jehan built her this memorial over which 20,000 men labored for 22 years to create a masterpiece in white marble inlaid with semi-precious stones. Standing as an epitome of love, the magnificent monument is set in a huge complex, equipped with well-maintained gardens and fountains. After breakfast visit Agra Fort, where Shah Jehan spent the last years of his life, imprisoned by his son Aurangzeb. The Peacock throne (now in Iran) was in this fort, before being moved to Delhi by Emperor Aurangzeb. Afternoon drive to Delhi and check into hotel for overnight stay. Evening at leisure. Services of our tour managers.